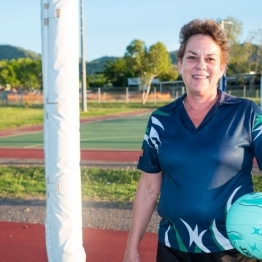 Turning 60 in June, grandmother of 10 Jill Meads is riding rings around women half her age. 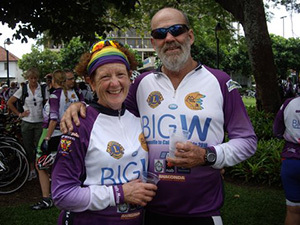 Starting off on the mountain bike with her daughter, then moving to the road bike which gets a run about three times a week at distances of up to 100km; Jill is using her cycling to make new friends, spend time with her husband, improve her mental health, increase her fitness and raise money for charity. And she’s loving every minute of it. How long have you been road riding? Apart from riding as a kid, I took cycling up as a hobby to keep fit in 2008. How did you get into it? I road to Pallarenda one day on a very old bike and couldn’t keep up with my hubby and a friend, but I enjoyed it so much I decided I had to try to get better. I purchased a mountain bike when my daughter took up mountain biking as it seemed like a lot of fun – being on the dirt suited me nicely at that time as I was very nervous on the road. Do you do any other sort of cycling? I recently tried track cycling at the Townsville Velodrome: It was a great skill builder, but I’m happy to watch others do the racing. I also tried a criterium session at the go-kart track and I wouldn’t mind exploring that a bit more. I enjoy doing the bike bootcamp at Cycle de Vie known as CompuTrainer - that has really helped to improve my fitness. NEW SESSIONS: Now you can improve your pedalling technique and power on a Wattbike and try BMX riding as part of the Women in Cycling Series. Who do you usually ride with? Mainly with my husband Colin and a friend about three times a week, but more recently I joined in with the Top Brand women’s riding group on Wednesday mornings, which has been a great confidence builder. I also like to add in a ride with the Free Radicals Tri Club: They have some nice long ones. What are your main reasons for riding? Being active (for a long time now!) has always been important to me, particularly to help manage my depression. It certainly helps get the happy little endorphins going and, of course, it helps with weight control and fitness. I love the rides that end with a coffee and chat with the girls: It’s just a great start to the day and riding is much kinder to my body than other activities I’ve tried in the past. 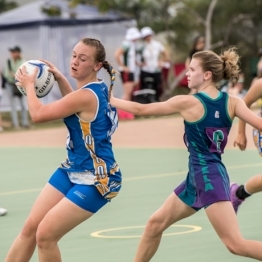 Have you met friends through the sport? Yes I have: the camaraderie is wonderful. What’s your biggest achievement on wheels? 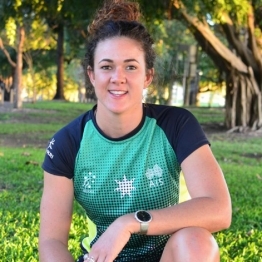 So far, it’s being involved in charity rides like Banish the Black Dog; Townsville to Cairns Bike Ride (you can donate to Jill and the Children’s Cancer Institute of Australia here), and the Conquer Cancer Ride in Brisbane. They are not just awesome rides or an opportunity to meet a lot of other cyclist from all walks of life; but it’s so rewarding to be able to raise funds for worthy causes. 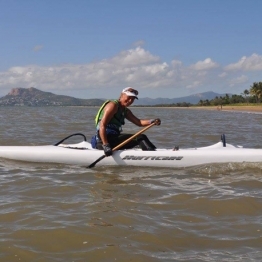 Also, last week I achieved a PB in a Pallarenda Time Trial training session – woohoo! What’s been one of your most memorable on-bike moments? That’s a hard one, but it’s difficult to forget when I had a tumble onto rocks mountain biking at Douglas: I corked my thigh – that really hurt! 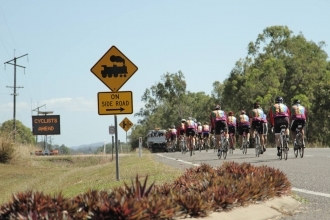 On a better note, my first Paluma Push in 2009 was very memorable: I did the recreational distance and it took me forever and I had a flat tyre in the first 10km, but the weather was beautiful and riding through the rainforest up there was amazing! I’ll also never forget the Conquer Cancer Ride last year: I road it with my best friend and my husband came along in the car for support. He kept our bikes rolling and had hot coffee for ready when we came in for pit stops to escape the rain. 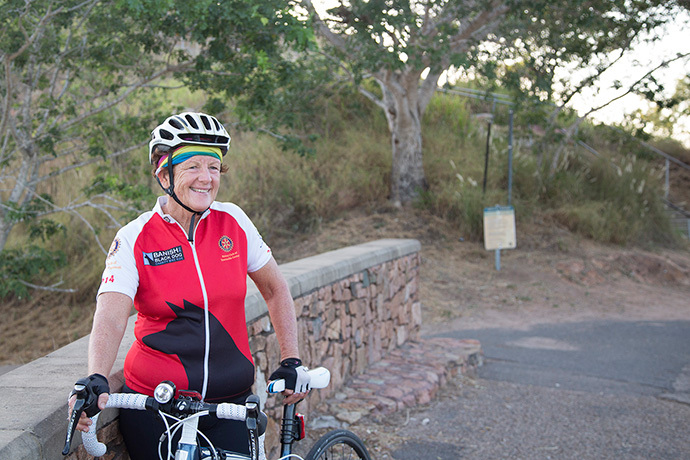 What’s your favourite riding route in Townsville? Riding to the Dam and up the wall early on any morning and taking in the magical view across the water, the wildlife, and the silence. Then there’s a good tail wind on the return journey. 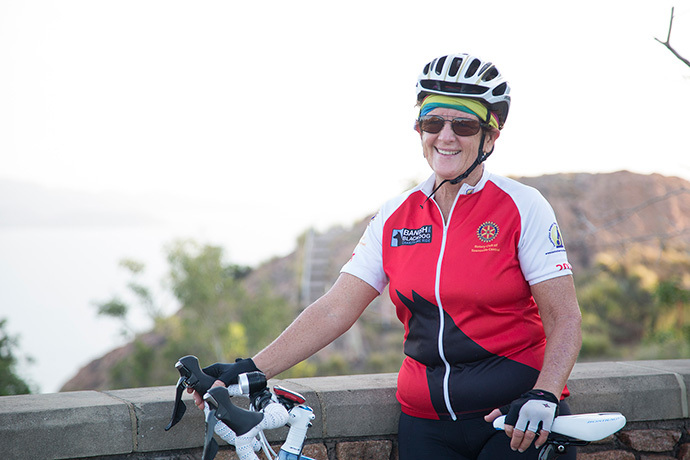 Do you think cycling is a sport for women that transcends age? Yes. Most people learn to ride a bike at an early age and it’s something you can return to after years of absence. Age shouldn’t be a barrier. What are your next goals? 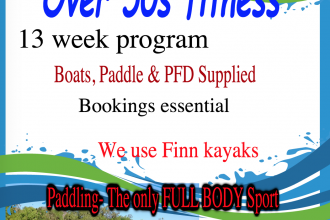 My next goal is to keep myself bike-fit while on holidays next month in the hope that I will be able to keep up with the Platypus group in the Townsville to Cairns Bike Ride. Hubby and I are off for a tour around Scandinavia for 20 days, and then we have 12 days in Austria where I will celebrate my 60th with a bike ride and cake. How good is that? The Pink Lady Tri – Jill’s first triathlon in March. Do you do any other activities besides cycling? Yes – I tried a tri! 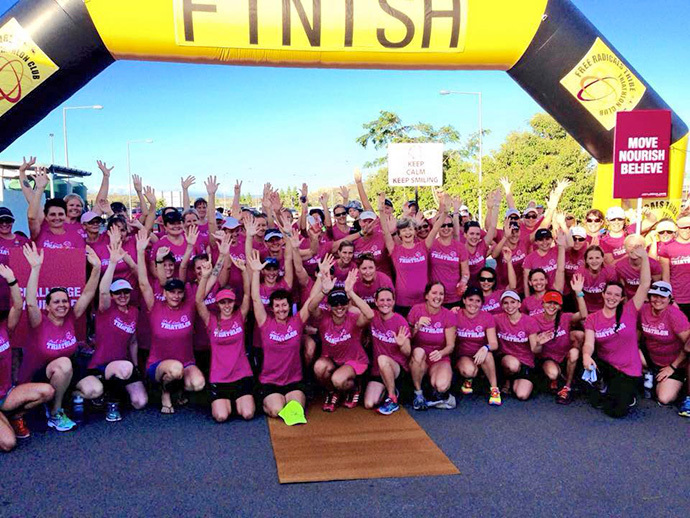 I joined the Free Radicals Triathlon Club and competed in their inaugural Pink Lady Triathlon in March, raising funds for breast cancer – it was a lot of fun and something I thought I’d never do. 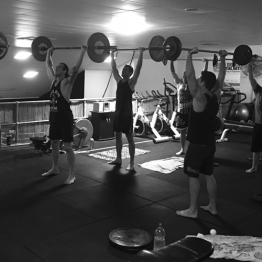 It involved six weeks of training on a Sunday with a diverse and fun group of enthusiastic women. I hope to do another tri in October. I also like to fit in a couple of yoga classes a week, which helps to keep me flexible. 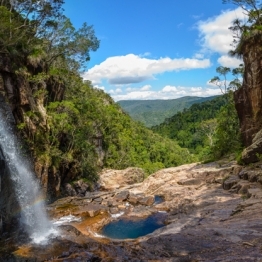 What’s your favourite thing to do on a weekend in Townsville? A long ride, followed by a perfect coffee (which my husband thinks you can only get at home, LOL), a yummy breakfast and a nanna nap! 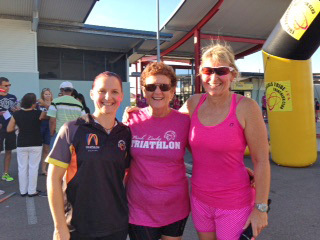 Jill with Holly Nayler and Pam Pemberton at the Pink Lady Tri. Are there any local riders you look up to? Daina Clark, Deb Latouf, Ruth Corset, Kym Lynch… the list goes on. They are all great ambassadors for the sport. Also, I always feel encouraged when I see older women riding – I think, “If she can do it so can I!”. I really admire local competitive riders and athletes Annika Frossling, Janet Curran and Pam Pemberton – they are amazing. Do you have any tips for beginners? Don’t be left wondering, “What if?”. Give it a go, learn the basic skills and understand road safety. 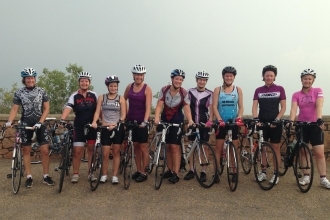 The Top Brand Cycles women’s ride on Wednesday mornings is a great starting point. Once you try it you will be back for more! Also, don’t see age as a barrier: young or older, most people have learnt to ride a bike as a kid and you never forget – you may be a bit wobbly at first, but as your confidence builds you will be wondering, like me, “Why didn’t I get into this 30 years ago?”. What’s the best advice you’ve received? When buying a road bike (which I only did last November), or any bike for that matter, make sure it fits you properly. This will help to avoid injury and mean you are comfortable and more efficient. What’s something that may surprise people about you? I barrack for NSW. 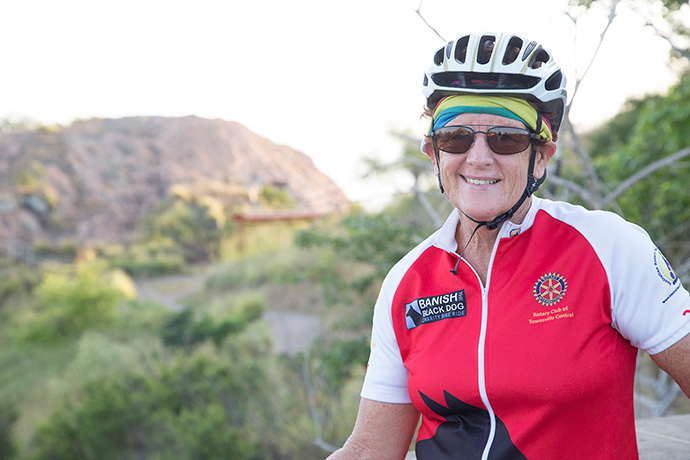 Do you think more women are getting into riding in Townsville? Definitely! Since I have been riding with the women’s group I have seen it grow every week. And just look at the amount of women riding mountain bikes: When I started in 2008 I was the only woman in my age group for most XC rides, now numbers have exploded. I think access to ladies-only skills clinics and rides help: It takes the intimidation away that some women feel. What are some of your other hobbies/things you do outside of cycling? We have 10 grandchildren; three of which I have nanna duties with on a regular basis. I volunteer at Uniting Care and Blankets of Love and I like to sew, particularly patchwork. If you want to try cycling, check out the free and low-cost sessions on offer as part of the Women in Cycling Series. 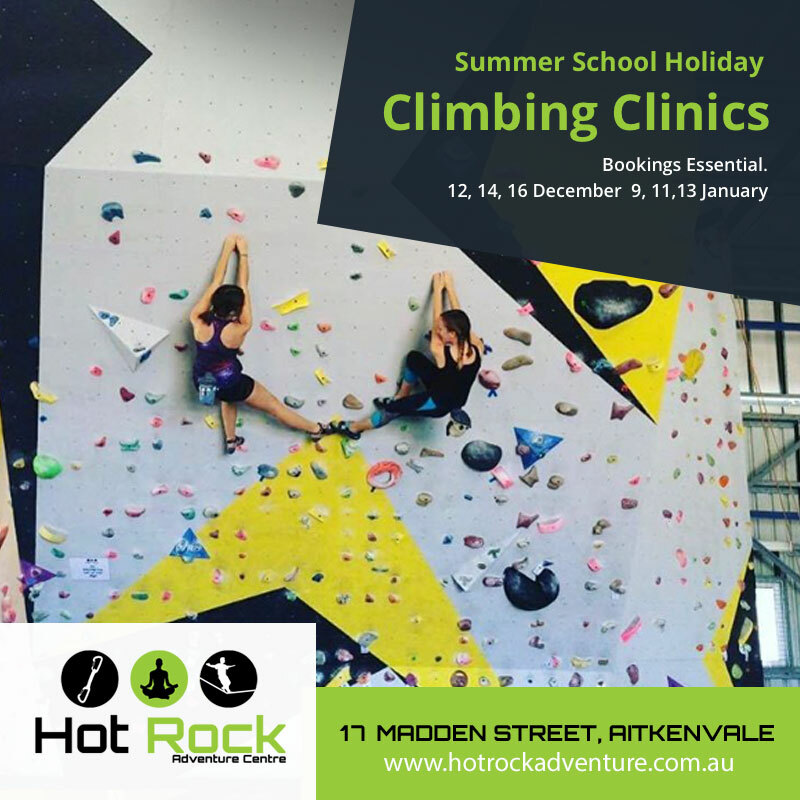 In the next week there’s mountain bike skills and bike set-up this Sunday, April 26; followed by the Top Brand Ladies Ride next Wednesday morning, a bike maintenance workshop on Wednesday night for men and ladies and Top Brand Cycles, and an exciting chance to try the Townsville-first Wattbikes on Thursday night – improve your pedal stroke and power while getting valuable feedback to can use for other training sessions. For all these and more see our Women in Cycling Series page.